A teenager didn't know she was having a baby until she was in labour because she hadn't shown any signs of pregnancy. 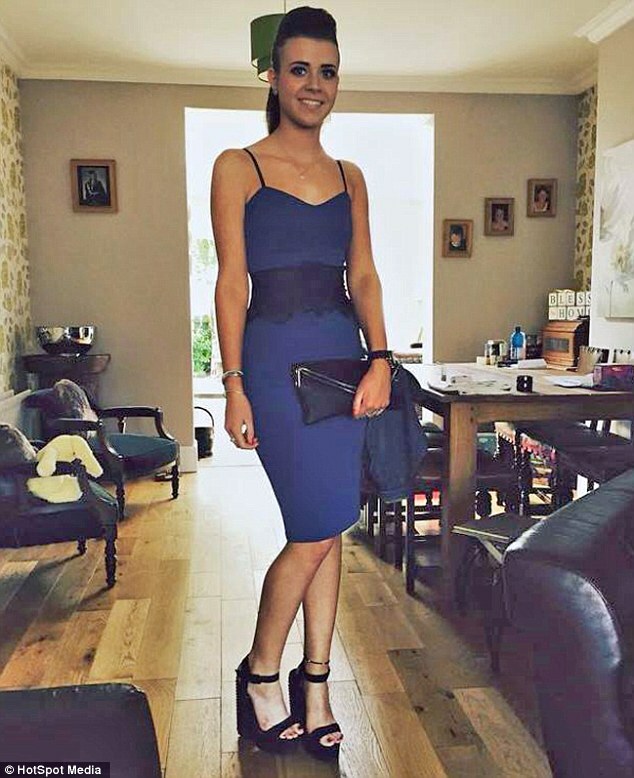 Charlotte Thomson, now 21, of Newcastle upon Tyne, had regular periods and was still slipping into her size 8 dresses so had no idea she was expecting. It wasn't until she took herself to hospital with bleeding and painful stomach cramps that medics told her she was about to give birth. Daughter Molly, now two, arrived two hours later. Nursery nurse Charlotte said: 'My stomach was completely flat, and I'd been having regular periods so it was such a shock when I found out. 'I didn't believe that I was actually pregnant until I gave birth. It was scary becoming a first-time mum with no warning. Charlotte, who fell pregnant with an ex-boyfriend, said she only put on 3lbs during her pregnancy and had felt more tired than usual but put the symptoms down to her party girl lifestyle. In December 2015 Charlotte woke in agony at 2.30am and realised she was bleeding profusly. She said: 'I took some paracetamol and hoped that it would blow over. 'Instead, the pain just got worse and I was in agony. An hour later I felt like I was going to be sick so I ran to the toilet and saw that my underwear was full of blood. Nurses at Northumbria Specialist Emergency Care Hospital examined Charlotte and told her she needed to speak to a midwife. But ten minutes later, a midwife performed an ultrasound and told Charlotte she was nine months pregnant and in labour. At 4.30am, a nurse phoned Charlotte's parents, Lynne Thomson, 50, a domestic cleaner, and Vincent Thomson, 50, an engineer, and told them their daughter was pregnant. Charlotte said: 'My parents thought that I was only a few weeks along and having a miscarriage. Two hours later, Charlotte gave birth to Molly. Doctors explained that she'd had no bump because Molly had been tucked up underneath her ribs. Charlotte said: 'It's crazy to think that I'd been carrying a baby all that time. Charlotte and Molly were discharged from hospital two days later – after Lynne rushed out to buy nappies and baby clothes. Charlotte says: 'My friends didn't believe me until they saw a picture of Molly. Luckily I'm still a size 8 and didn't need to lose any baby weight. 'Molly has joined the nursery that I work at so I can take her with me, which is perfect. 'Molly's dad is an ex who is no longer in the picture, but I have plenty of help from my parents with the baby. I'm no longer a party animal but it's worth it to have Molly.